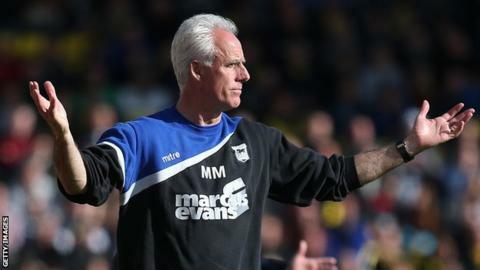 Ipswich boss Mick McCarthy has said his side's two games without a win has not ended their play-off push. Town picked up just one point over the Easter weekend but remain a point outside the Championship's top six. "It's about what you end up with. We could end up with two wins from the last two games and be in the play-offs," McCarthy told BBC Radio Suffolk. "We could go to Burnley and get slapped by a promoted side. But it's brilliant that we're still there." Sixth-placed Brighton could only draw both of their games over the weekend, enabling Nottingham Forest to move within a point of them after their two wins. It meant Ipswich could have moved into the play-off places had they beaten Bournemouth on Monday, but were held to a 2-2 draw. With a trip to Burnley, who have now secured promotion to the Premier League, and a visit of Sheffield Wednesday on the final day of the season to come, Town still have an opportunity to reach the play-offs. McCarthy said: "I'm loving every bit of it. Me and TC [assistant manager Terry Connor], we thrive on these situations. "It's lovely that the players give us everything. "Burnley might not start against us so great. But I remember playing against Norwich (in May 2004) when I was Sunderland manager. They had been promoted and we were desperate to get into the play-offs. "We had to batter them to win - scrap and fight. I don't see any easy games."